Fiona and Ian would love to welcome you to stay in our holiday accommodation in one of our self catering holiday cottages in Airds Bay, Taynuilt not far from Oban. Oban is one of the biggest towns in Argyll and Bute, Scotland and is the "Gateway to the Isles". Our self catering accommodation properties are ideal for a relaxing holiday and all have fantastic views of the surrounding mountains and loch. But are not far the ferry links in Oban. We are pet friendly and dog friendly, having 3 properties that take pets. 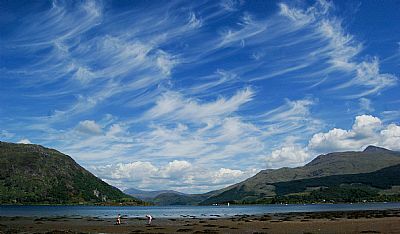 This is one of the most stunning areas to visit in the West of Scotland, if not in the whole of Scotland. Make our self catering properties your accommodation base to explore the outstanding scenery of mountains, lochs and islands that make up Argyll and Bute and have a fantastic holiday. The spectacular alpine views you get of Loch Etive, Ben Cruachan and the surrounding mountains from all our self catering properties are second to none. Stay at one of our 6 quiet, relaxing and peaceful self catering properties on the shores of Loch Etive, near Oban, Argyll. You have the choice of a cottage style apartment, 3 brand new luxury wooden cabins, a static caravan a 3 bedroom detached cottage or our cosy croft camper van. All with enclosed gardens and patios. We are pet friendly and dog friendly, we take pets in 3 of our properties. We have also one site for a motorhome which is registered with the Caravan and Motorhome Club. There is a seemingly endless list of things for you and your family to do in the area that offers something for everyone. Choosing our accommodation in Taynuilt (12 miles (19km) East of Oban) will be one of the best decisions you make for your Scottish self catering holiday of a lifetime.